There have been a number of memorable last-minute catches that propelled anglers to victory. But two in the same tournament where both anglers figured that buzzer-beater kicker was the winning fish? 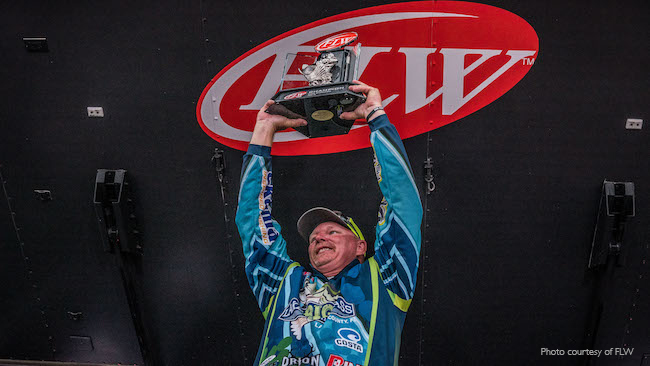 That’s exactly what went down at the FLW Tour opener on Okeechobee this past weekend, as Tim Frederick and Bryan Schmitt both caught giants with about 10 minutes to go. Schmitt’s was a 6-pounder, which would’ve sealed the deal if Frederick hadn’t caught a 9-pounder at almost the exact same time. Frederick’s big girl was enough for him to edge out Schmitt for the title. The two both held leads the previous days. Schmitt led after days one and two thanks to slow-rolling a Riot Baits Recon Bladed Jig with a Riot Baits Fuzzy Beaver trailer down in patches of hydrilla and pencil reed and lily pad stems. Meanwhile, utilized his local knowledge of how Florida bass set up to spawn to catch bedding fish he couldn’t see. He used a one-two punch of a Strike King Ocho and a Strike King Pure Poison Swing Jig, making precise casts to specific targets. The win marked quite the turnaround for Frederick. His rookie season in 2016, he finished dead last in his first major event at Okeechobee. Two years later, he hoisted his first trophy. The Leesburg, Fla., pro has been on quite an upswing in the last 12 months, as his average in all events has jumped from 517.351 to 692.05. That said, he’s still only ranked 184th in our Majors Ranking, but with his home waters up next for the tour he could see another move upward soon. Schmitt is also coming into his own as a pro; taking it to a different level than Frederick. He’s long been dominant around his home waters in Maryland and the minor events on the east coast, but he’s now ranked 71st in the Majors Ranking. He’ll drop some awful 2016 event off in the coming months, and if he keeps fishing as he’s been he’ll skyrocket up the rankings. Heading in the other direction in the rankings is Andy Morgan. This Okeechobee event was his worst finish since 2009, which dropped the former No. 1-ranked angler all the way to No. 8. That leaves Bryan Thrift and Michael Neal as the two closest to unseating Jacob Wheeler from the top spot.